Mulch is any material that is spread or laid over the surface of the soil as a covering. It is used to retain moisture in the soil, suppress weeds, keep the soil cool, and make the garden bed look more attractive. Organic mulches also help improve the soil’s fertility, as they decompose. Organic mulch will decompose and have to be replaced, but in the process, it will also improve your soil’s fertility and its organic content. The dryer and woodier the mulch, the slower it will decompose and the fewer nutrients it will give to the soil. It pays to know the origin of manure, compost, and straw since these materials can contain viable weed seeds. The last thing you want is to spread a mulch that is going to start sprouting and make more work for you. Each type of organic mulch has its own use. Bark mulches are best used around trees, shrubs, and in garden beds where you won’t be doing a lot of digging, like front walkways and foundation plantings. These woody mulches don’t mix well into the soil, and it can become a hassle to have to keep moving them aside to make way for new plants. They will, however, last longer than finer organic mulches. Compost and composted manure can be used anywhere, as long as they are relatively well composted and weed free. You can use them as a coating of mulch or simply side dress plants with them during the growing season to insulate and give a boost of slowly released nutrients. Grass Clippings are a mixed bag and are best suited to remote areas of your garden where you want to suppress weeds. Grass clippings, like most green plant debris with a high water content, decompose very rapidly, and in the process, they can get somewhat slimy, with an unpleasant odor, so use with discretion. Grass clippings also tend to mat down and not allow water to pass through. Ideally, you should use a mulching mower and leave the clippings on the lawn to add fertility to that soil. If you do bag your grass clippings, don’t throw them away unless you have used weed killer or some other herbicide or pesticide on your lawn. Synthetic lawn care products can be bad for some flowers, and you certainly don’t want to use them in your vegetable garden. Untreated grass clippings can either be dumped into your compost bin or used to mulch open, unplanted areas. Newspaper as mulch is becoming more and more popular. Most newspapers have switched over to organic dyes, especially for their black & white sections. Shredded newspaper has been used for years to keep plant roots moist while shipping. Layered sheets of newspaper also have great moisture retention abilities, and they act like other organic mulches as far as suppressing weeds and controlling soil temperatures. They are also great for smothering existing grass, to jump-start a new garden bed. To use as a mulch in the garden, spread a layer of four to eight sheets of newspaper around the plants. Moisten the sheets to keep them in place. On windy days it’s easier to moisten the sheets before you place them down. Cover the newspaper with a one to three-inch layer of another organic mulch and the weed protection should last throughout the growing season. Shredded Leaves are natures favorite mulch. They can be used as mulch anywhere and have the added bonus of being free. You will also entice more earthworms to your garden soil. Some gardeners don’t like the look of leaves in their garden, and they probably aren’t appropriate for a formal setting. If you spread a layer in the spring before plants spread out, the leaf mulch tends to blend into the view within a short time. Shredded leaves are perfect for woodland gardens, and if you spread a layer over your vegetable garden in the fall, it will begin decomposing over the winter. Unshredded leaves can mat together and repel water in rainy areas. If that happens, you can always rake and fluff them up a bit if they appear to get matted. Straw and salt hay are popular mulches for the vegetable garden. They keep the soil and soil-borne diseases from splashing up on lower plant leaves and make paths less muddy. Straw decomposes very slowly and will last the entire growing season. It also makes a nice home for spiders and other beneficial insects who will move in and help keep the pest population in control. Finally, it’s easy to either rake up or work into the soil when it’s time to plant a new crop or put the vegetable garden to bed. Synthetic and inorganic mulches do a good job of holding moisture and blocking weeds. They don’t add any fertility to the soil, but they don’t decompose and require replacing as often as organic mulches. If you like the functionality of plastic or landscape fabric but not the look, you can always add a thin layer of bark mulch on top of the plastic or fabric for camouflage. As the bark decomposes, weed seeds will be able to take hold on top of the plastic or fabric. You will also need to replace the bark as it disintegrates. If you’re building raised beds, consider making them the width of your plastic or fabric so that you can cover the bed without seams. Plastic and Landscape Fabric are good choices for around foundation plantings and other shrubs and trees. These plants don’t require frequent fertilization and, for the most part, you won’t be working in these beds regularly, so you don’t want to have to worry about weeding them throughout the summer. Plastic gets very hot in the summer and, besides smothering weed seeds, it can also kill all the good things in the soil, including plant roots, unless there is sufficient moisture. Be sure to cut holes in the fabric to allow sufficient water to pass through. If you are seeing puddles accumulate on top of the plastic or fabric, you don’t have enough drainage. Landscape fabric is porous and shouldn’t be a problem unless it gets blocked. Gravel and Stone work well as mulches in areas that require good drainage or beds with plants that like a little additional heat, like Mediterranean herb gardens and rain gardens. Stone is hard to remove, so give it a lot of thought before using stone or gravel as a mulch. 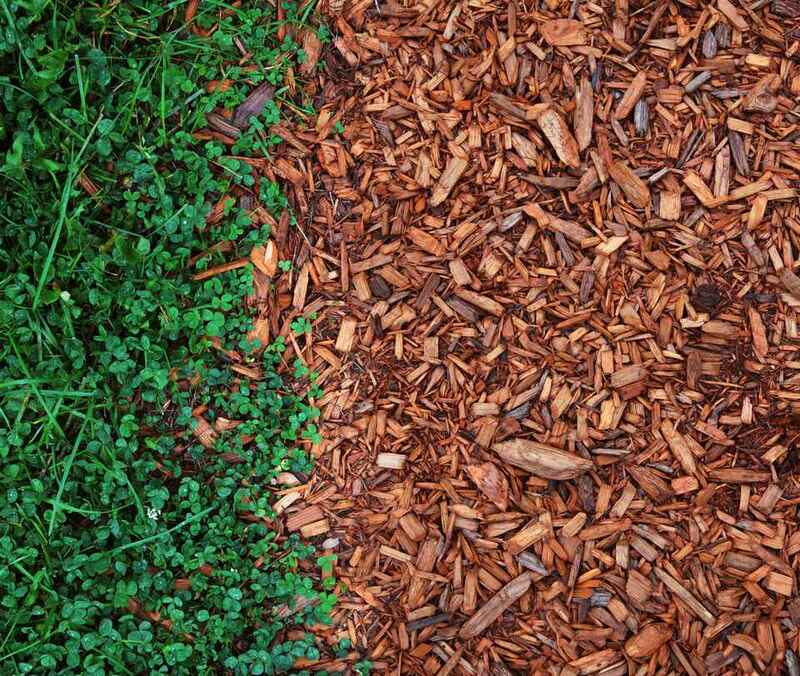 Which mulch you choose depends on the function and aesthetic you are looking for. There are more and more choices each year, so review your options before you start spreading and choose a mulch that will please you and aid your garden for many years.